We are proud of our inclusive approach to learning throughout the school, catering for every child’s needs. The whole family is important and we take time to help and support each child in all their learning needs. Our teachers and teaching assistants work together in a supportive team, ensuring that basic skills are taught effectively whilst providing an exciting, creative approach to the whole curriculum. We encourage first hand learning experiences and aim for every child to be engaged and motivated in their learning. The five outcomes of Every Child Matters – stay safe, be healthy, enjoy and achieve, make a positive contribution and achieve economic well-being – are fundamental to everything we do. We use our outdoor environment for science, maths, speaking and listening, art and much more. We have extensive grounds with different play areas, woodland area, wildlife area, and allotments. There are many enrichment opportunities provided through visitors to the school and visits to places out of school. We have been accredited with the Healthy Schools award which commends our focus on Healthy Eating, Physical Activity and the provision for Emotional aspects to learning. 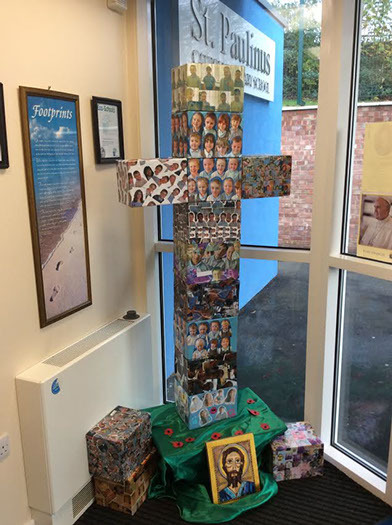 St Paulinus is an open, friendly school which provides education for children aged four to eleven years of age. It is our aim to provide a stimulating environment in which each child can develop fully as an individual. We will help all pupils develop their personal and social skills and achieve their full academic potential. We encourage them to be independent and resourceful and to value and consider the needs and feelings of others. We hope that this website will give you a hint of what our school is all about, but this can never replace first hand experience. Therefore we would encourage you to come and see us in action and speak to our staff and children yourself.